The idea of resonances and responses as a fundamental compositional principle is found in many of my compositions. I have used it in instrumental pieces both with and without electronics, in theatre contexts, in conceptual works and in intertextual and intermusical referential structures. In Terpsichord, a piece for percussion and pre-recorded sounds, the resonances from the acoustic instruments form sonic bridges to the pre-recorded electronic sounds, that, in turn, prolong the resonances, re-shaping them into new sonic gestures. A dialogue of actions and reactions is created that drives the trajectory of the music. The term resonance has its origins in acoustics and describes how a vibrating object creates sympathetic vibrations in other objects. It can also be used metaphorically to describe how something we hear or see can be set in motion within us, evoking associations or strong emotions, and how works of art are reinforced and reflected in other works with similar features. In this article I present examples from my own works discussing how resonances and responses are used in solo instrumental pieces with electronics, concerto works, as well as in theatre music works. At the centre of the stage is a large wooden box with a number of piano strings. Around it more objects; drums, glass chimes, a gong, a cardboard box, an old zither. Microphones. Behind it stands the player. He focuses for a few seconds on the top strings of the instrument. Silence. Then he makes one simple action. He strikes the highest string on the instrument with a plectrum. A sharp attack. The sustained sound from the string slowly decays (see Figure 1). Figure 1: Opening of Terpsichord (part 1). The player has also set another sound in motion. A sustained sound, like a resonance from the string. It expands the sound from the cimbalom into a pedal note, becoming a sustained texture. It has a very specific sonic character that colours the whole piece. As listeners we perceive this sonic material as if the sound is a consequence of performer’s action - the plucking of the string. However, it is a pre-recorded sound, played back from a computer. He strikes the string again. The sound is little different as he uses another stick. He strikes the string again, yet another sound colour, yet another stick. Then he plays with a string bow, the second time with a crescendo that seem to trigger a sound in the tape part like an echo, a sound that is thrown away into the distance. But then it bounces back, a crescendo, which makes him respond with a new gesture, a reaction to the sampled sounds (see Figure 2). Figure 2: Extract from Terpsichord (part 1). Sound Example 2: Extract from Terpsichord (part 1). This performance took place on 23 March 2014, at the Beyond Pythagoras Symposium at the University of Huddersfield. The percussionist Jonny Axelsson performed Terpsichord, a piece for percussion and electronics, using the custom-made bass cimbalom as the central percussion instrument. The audience were seated around him, close to the percussion instruments, with loudspeakers encircling them (see Figure 3). Figure 3: Jonny Axelsson performing Terpsichord at the Beyond Pythagoras Symposium March 2014. (Photo: Rose Dodd). Terpsichord is like many of my pieces. It is composed in such way that the solo instrument triggers other sounds and events - it makes them resonate. These resonances cause what could be described as kinds of acoustic feedback. The resonances become new musical layers in themselves and reflect back on to the solo instrument. A cycle of actions and reactions, responses and dialogues is created (see Figure 4). Figure 4: Extract from Terpsichord (part 1). Sound Example 3: Extract from Terpsichord (part 1). These kinds of distinct musical gestures are commonly used features in my works. A kind of physicality, not only in how the music is structured or the gestural qualities of the sounds, but also how the musician plays, moves, strikes and bows the instrument. The physicality is also musical materials for the compositions. The idea of resonances and responses is not only found in works with instruments and electronics. In my concerto for guitarist and orchestra, Corde (with movements titledFascia, Collagéne and Colloide), the figures and gestures of the soloist’s part resonate in the orchestral part in the same way as the bass cimbalon resonates in the electronics in Terpsichord. The idea of composing with resonances in this way is applied at both a gestural and an harmonic level throughout the work. The peculiar tuning used for one of the solo instruments (see Figure 5) , the unusual eleven stringed Glissentar , with its five double strings and a single bass string, opened up interesting harmonic sonorities and striking chord progressions. Figure 5: Tuning for the Glissentar in Collagéne (movt. 2 of Corde). The unusual tuning also facilitates complex interweaving lines of musical material (see Figure 6). Figure 6: Collagéne bar 9, solo part. The quick two-part gesture in the solo part in bars 9 and 10 is resolved into a calming C7-chord in bar 11. The chord is extended out into the orchestra and is then sustained through arpeggio figuration in the solo part (see Figure 7). Figure 7: Collagéne bar 10-12, solo part and strings. Sound example 4: Extract from Collagéne (movt. 2 of Corde). The arpeggio figuration is repeated and then slowly transformed by the introduction of small glissandi - a simple process as the Glissentar is a fretless instrument. These transformations become new figures and new chords. The arpeggios and glissandi figures are echoed in the strings. In the large string section the individual figures dissolve into larger textures that gradually descend into the bass register. In the final part of this section the cellos have harmonic glissandos that are then echoed by the soloist - a response that triggers the next section of the concerto. In the Webster New World College Dictionary resonance is defined as “reinforcement and prolongation of a sound or musical tone by reflection or by sympathetic vibration of other bodies”. The bass cimbalom (see Figure 8) used in Terpsichord has 17 piano strings attached to a wooden box. When the strings are struck the vibrations propagate and reflect within the wooden box, making the strings sound louder. The tuning of the strings is based on selected pitches of an harmonic overtone series that also helps the reinforcement of the sound through sympathetic vibrations. But the definition in the Webster Dictionary also summarizes the basic compositional approach in Terpsichord: The player’s interaction with the instrument as well as the acoustically produced sounds’ prolongation in the pre-recorded material. Figure 8: The Bass Cimbalom. The Webster Dictionary initially states resonance as “the quality or state of being resonant”. Under the influence of a source that makes something move within the body, sympathetic vibrations, becoming resonant. Resonant, when referring specifically about sound, is defined in the Collins English Dictionary as “resounding or re-echoing”  which clearly points back to the French and Latin origins of the word - “the verb resonare, from re- (expressing intensive force) and sonare ‘to sound’.”  Sounds returning. Sounds responding. Echoes. Echoes however, are an only an empty repetitive answer. A response carries something else. A reaction to a sound, a conscious answer. But the words ‘resonance’ and ‘resounding’, originating undoubtedly with a connection to sound, have more meanings. Random House Kernerman Webster's College Dictionary also defines ‘resonant’ as “made intensely significant, profound, or allusive”  while the Oxford dictionary gives examples as “(Of a place) filled or resounding with (a sound)”  and ”Having the ability to evoke enduring images, memories, or emotions”. Putting the sentences above together in a slightly modified way would result in the following phrase - “A place filled and resounding with sounds that have the ability to evoke enduring images, memories and emotions, intensely significant, profound and allusive”. The new sentences now, for me, indicates musical imagination, compositional intuition and multiple intertwined meanings rather than a singular quality. The resulting sound can evoke images and memories; the sound is profound and allusive. Terpsichord Part 2: Sonic Bridges. My encounter with the bass cimbalom that Jonny Axelsson had built together with composer Volker Staub not only stimulated my sonic imagination but also evoked images and emotions beyond the sounds. The sounds not only made my eardrums vibrate; they also resonated emotionally within me. These emotional resonances became important for my work in the studio when I was working with the sonically rich sounds we had recorded with the instrument (see Figure 9). Figure 9a: Jonny Axelsson rehearsing Terpsichord, April 2013. In the second part of Terpsichord textures comprising strings, chimes and tremolo playing, are set in motion by a musical figure made from a gong crescendo that climaxes with a strike on crotales. The pre-recorded textures resound throughout the room, eventually being taken up in the instrumental part. As if these figures are resonating within him, the percussionist plays tremolos and fast irregular, but somehow repetitive, figures. These figures are in the same register and use similar sounds and textures as the pre-recorded materials. The glass and metal chimes that are hanging above the bass cimbalom are set in motion, resonating with the textures. The music is deliberately light, floating and glimmering with swarms of small sound objects flitting in and out of the sound spectrum (see Figure 10). Figure 9b: Terpsichord (part 2) - beginning. Composing with Music History as Resonating Sonic Bridges. In 1999 I composed a work for four voices and pre-recorded sound based on the well-known sacred textStabat Mater. It was based on the original Gregorian chant from the 11th Century, but not on the notated melody but on a recording of it. The spectral content of the sounding hymn was treated in various ways and was the building material for my composition. Even though a modern compositional technique was used to construct the work (inspired by the French spectralists), the resonance of medieval music and the sacred were also influencing factors on the work. These latter influences manifested themselves not only through the nostalgia for old music or the sound of the voices so strongly associated with chanting, but a pervasive spirituality that, in dialogue with the contemporary, became timeless. To find resonating bridges between, for example, acoustic instruments or voices and electronic or sampled material, I have used IRCAM’s AudioSculpt and Open Music software to be able to ‘look’ into the spectral content of sounds and take out important partials and use them as material to build harmonic structures and, more importantly, to create harmonic bridges between the different sounding elements in a composition. Figure 10: Translating sound recordings to traditional Western notation through AudioSculpt and Open Music. A few years after composing Stabat Mater I took a similar approach in Le miroir caché for soprano, ensemble and electronics (2002). However, this time the ‘musical’ resonance was the zeitgeist of contemporary music in Vienna circa 1910. A recording of Pierrot Lunaire (1912) by Arnold Schönberg functioned as a point of departure for the shaping of the voice part, the harmonic structure and the sonic bridges for the instruments and electronics. This early key 20th century work of the classical repertoire became a resonating sounding board towards which the voice and the instrument could sound and vibrate. The sonic bridges in these examples are thus multifaceted; it is both the actual sounding material like the harmonic and gestural connections between voices and instruments, as well as the experience and memory of our common music history that resonates. Sound example 7: Le miroir caché - start of part IV. A warning commentary on resonance and a reflection on temporality in sound sculptures. The piece by Palme was performed by Rhodri Davies at the Beyond Pythagoras Symposium whereTerpsichord was also performed. Pia Palme was however, not only present as a composer but also as a performer in works by Eliane Radigue for subcontrabass recorder, both solo and in a duo with harp. This concert was a stimulating contrast to my own work. The pieces are very different and require fundamentally different ways of listening. In Radigue’s works such as Occam I, Occam XIV and Occam River I it is the inner structure of the evolving sounds that are the central musical concern. It must be approached as a sculpture, a sculpture of sounds. As listeners it seems possible for us to ‘walk’ around the sound, stop for while, listen, reflect, and then continue. The sounds are moving, transforming in slow processes. I noticed how I lost all sense of time passing while listening, the only time existing was time required for the sound waves to move in space. Terpsichord Part 3: A Theatre of Sound Objects. In Terpsichord the resonances from the instrument in the electronics part are not really taking place, we merely perceive them as such. It is the same process with the responses between the soloist and the pre-recorded sounds; we only perceive the sounds as interacting. The player responds to the sounds from the computer, the sounds respond to player. Despite the fact that they are all pre-recorded, the fact that interaction is perceived, both for listener and the performer, is decisive, but not implemented technically. The interplay of gestural materials and the approach to resonances and responses as demonstrated in Terpsichord, are fundamental compositional methods for me. But what meaning do such gestures, resonances and responses carry for the listeners? What does a musical gesture imply? Does a gesture in itself carry any meaning? When does it take on a meaning? When does a response take on meaning? A resonance? Can similar questions be asked when it comes to combining music with other art forms? The different texts in Le miroir caché respond to each other, comment on each other and the intertextuality becomes the central resonance at play in the work. Teatr Weimar – Language and Sonic Art Theatre. For several years I have been collaborating with the theatre group Teatr Weimar in an investigative series of performing art works. Although somewhat difficult to define, our works has been labelled New Music Theatre, Composed Theatre or, as our collaboration was initially called, Sonic Art Theatre. The point of departure was then the contradictory idea of staging radio plays, hörspiel as stage performance. From a theatrical perspective Teatr Weimar have be described as post-dramatic theatre. Hans-Thies Lehmann  established and defined the term as the new form of theatre where it is no longer the dramatic text that is the fundamental element in a performance. Instead it is based on other means of expressions, i.e. musical structures, performance, dance or visual elements like video-projections. However, the critical investigation of language in texts and performances is central (see Figure 12). A Study On Apparent Behaviour. At one point, while discussing the interaction between actors, the notion of scenic situations and methods on how to work with action-analyses in experimental dramatic texts, we came across research within the field of cognitive psychology, specifically Fritz Heider and Marianne Simmel’s ‘An Experimental Study of Apparent Behaviour’ (1944) . In the study Heider and Simmel investigated how we perceive other people, their behaviour and how we attribute them personal qualities through their actions. In the film we are actually looking only at a few simple figures that in themselves do not carry any information about what their intentions might be or what characters they are. This is given to us through the way we think they behave. It is through their actions, reactions and interactions that we interpret, structure and create possible narratives. Through the way we understand the figures intentions we also attribute them characteristics. Figure 14: Figures used in Heider and Simmel’s animation. Terpsichord Part 3 - Behaviour of Sound Objects. Whilst considering the study by Heider and Simmel I wondered if the same questions could be asked about sounds? Do sounds take on meaning if we perceive them as interacting? If the sounds react and respond to one another? I did a simple and short experiment. Very quickly, without reflecting on the choices, I collected a few random short sound objects on my computer. First I placed them in a sequence with a silence of equal length between them. Playing back the sequence was merely a linear presentation of the individual sounds without any relation between them. I then arranged them a little differently. I kept the same order but moved the sounds so that that there were different periods of silence between them. Mostly I put them closer to each other with the sounds overlapping sometimes. I also added different volume envelopes. When I started to arrange them I began, almost unconsciously, to listen for the moment at which I began to perceive them as interacting. I searched for relational placements and envelope shapes which resulted in me perceiving the sounds as having a direction or an intention to interfere with the other sounds. This temporal relationship creates a kind of meaning where the perceived behaviour and actions of the interacting sound objects are attributed characteristics. So, is this music then? At what point do we start hearing such arrangement of sounds as music? The search for meaningful relationship between the sound objects in my short experiment is the same method and approach to combining sonic material as found in many of my pieces. A clear example is the third part of Terpsichord where the sound events seem to be struggling against one another, pushing at, stopping, responding to, or escaping from one another (see Figure 15). It seems to me that when we perceive sound objects as interacting, just as with the simple figures in the study by Heider and Simmel, we create narratives in order to structure what we hear. Expectations and consequences, fulfilled, or not, become resonances for the unfolding narratives emanating from the actions perceived. Figure 15: Extract from Terpsichord part 3. Sound example 8: Extract from Terpsichord (part 3). Arrival Cities: Malmö – resonances of the present. For the past few years I have also worked with Teatr Weimar investigating current political issues concerning the new Europe and different crises, especially the migration problems and the borders of Europe. In a series of works called Arrival Cities it is the different perspectives on migration that is central, how language and the politics form how we, inside the borders of Europe, view the refugees and those that come to seek a better life. We take their voices and we write their stories. Canadian journalist Doug Sanders introduced the term “arrival city” and in his book with the same name  he writes about the final shift of human populations from rural to urban areas, which he argues is the most important development of the 21st-century. One part of the performance can be described as a heated discussion for everything presented on stage - the three actors, the two musicians, the electronics and the visual scenography. The interaction between all of these parts is meticulously through-composed, mixing different methods for notation, where the method used to notate these events always being based on what best informs the interaction of events. In this performance it is no longer any classic literary or other such references that resonate but current political situations. The scene is based on a kind of language use that is found in everyday debates on politics and later in the work on a real incident, a well-known scandal involving Swedish right-wing politicians. I integrated some existing pieces into the performance, as a part of the overall dramatic structure. Among those pieces were Terpsichord. In the following short examples we can see how the third part of that work interrupts the actor and changes the scene (see Video Clip 1). The music responds to the actor’s aggressive repetitions. The actor is sitting on the floor and is facing away from the audience. However, his actions are filmed and projected on the large screen at the back of stage. As viewers we experience a double perspective. Video Clip 1: Arrival Cities: Malmö, scene 3 end / start of Terpsichord (movt. 3). The final sounds from the third part of Terpsichord are sustained; they resonate into the next scene and become new material that also triggers a lighting change on stage. The scene is transformed into a strange, sickly green light. It will later turn to cold blue, something that may remind us of a cold, sterile hospital; an association that seems to be confirmed when the female actor keeps asking one of the male actors if he is ill. He keeps pondering that he is well, despite all the blood dripping from his head. As a refugee without papers he can not be found by the authorities. The last gesture of the third part of Terpsichord triggers the trombone player in the ensemble to try to blend with the percussion sounds (see Figure 17). The low pedal notes and slow timbre changes are akin to the strange lights (see Video Clip 2). Video clip 2: Arrival Cities: Malmö, Scene 4 start / End of Terpsichord (movt. 3). The sounds slowly transform from on-going gestural processes into static spatial properties. It becomes a sonic space surrounding us - a sounding space, embracing both the performers and the spectators. This process is matched in the lighting design. Jörgen Dahlqvist, the director of Teatr Weimar uses light to highlight the dramaturgical process at work. In this work the lighting design can be considered as driven by time processes and not as static scenes. Figure 17: Ivo Nilsson on trombone and Jonny Axelsson on percussion in Arrival Cities: Malmö. 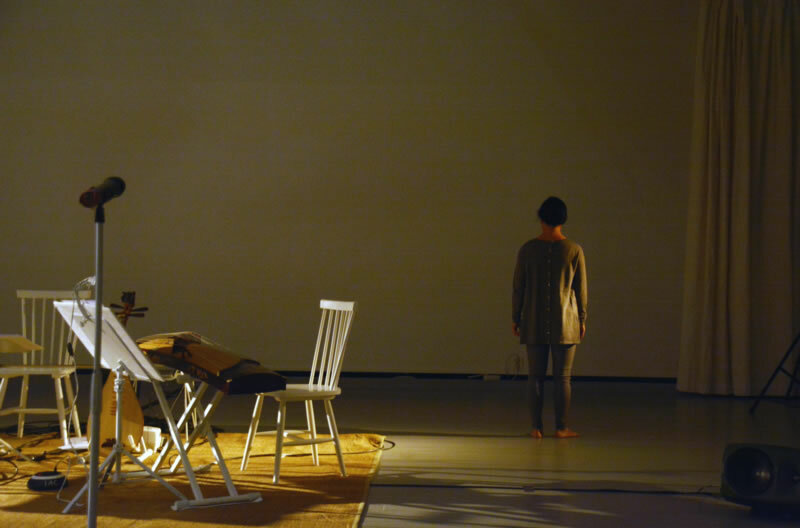 The interplay between all elements on stage in Arrival Cities: Malmö is composed in a similar manner the sound objects in Terpsichord. They act and respond, they create visual and acoustic resonances, historical and social resonances; they bridge and contradict each other. Terpsichord Part 4: The Melancholy of Memories. In 2014 we returned once again to the concept of ‘arrival cities’, now focusing on the city of Hanoi.Arrival Cities: Hanoi is a piece for the trio The Six Tones, a group performing new experimental and transgressive music on Vietnamese instruments, with roots both in traditional Vietnamese music and in Western contemporary experimental music. The work deals with the dissolution of the relationship with tradition that urbanization brings (see Figure 18). Figure 18: The Six Tones in Arrival Cities: Hanoi, November 2014. Photo credit: Miguel Cortés. Though the work contains much music it goes far beyond a traditional concert performance. The work includes electronics, video, choreographed parts as well as spoken parts where the performers relate stories to the audience. The different elements are superimposed throughout the performance, creating a flowing dramaturgy. The videos are documentary material from Hanoi. A central part of the work is an interview with Luu Nguc Nam, an actor and costume maker for traditional Tuong theatre. He tells his life story; about his travels around the country, his homesickness and the tension between the traditions that he experienced. Now old, he remembers with tears in his eyes about his past as a successful Tuong actor. The part is emotionally powerful and is accompanied by slow music coloured by long reverberation. The Vietnamese instruments used in the performance are the monochord dan bau, the lute dan ty ba, the electric guitar with scooped frets and the 17- and 21-stringed zithers dan tranh. All of the instruments are amplified and presented through a multi-speaker setup which makes the whole performance space into a giant resonating box where sounds and memories merge into one. But it is not only through the videos with Nam we are informed about the story of the people of Hanoi. The performers also relate their memories as children moving to Hanoi, their first meetings, and their early dreams and ambitions. In addition they talk about their meetings with Nam, and their impressions and reflections of their encounters. These memories become multi-layered and blurred. The memories are shared and resonate within us all. Towards the end of the work the music is reminiscent of old classical European music, almost as an echo of past colonial times. It is a reminder that we all exist in a world of eternal changes and ephemeral phases just as the arrival cities are now. The music in this final section is like ruins, it “… express the passage of time, and more specifically the qualities of impermanence and transience, all closely associated with melancholy. Ruins induce a contemplative state of mind, suggestive of events and lives from past ages that have come to an end.”  At this point the work conjurs a nostalgic memory of the past. This is a constructed memory as none of us living now remember the colonial age through our own experiences. Somehow though it resonates within us, with a slight bittersweet taste of melancholy of something that used to exist, but has ceased to be. The feeling of loss of something we never had. Look here, says Jörgen, the director, pointing at two pictures (see Figure 19). One of them is a photograph from the performance, another one a painting from 1901. The similarity between them demonstrates how the stage design resonates with the past, just as the music does. Sound example 9, Extract from Part 3 of Arrival Cities: Hanoi. A huge, strong chord. The whole instrument explodes in a sonic firework. Then Jonny Axelsson starts a simple, slow progression of upward notes (see Figure 20). Step by step, higher and higher, from the lowest to the highest tone, through the whole range of the instrument, until there are none left to play. Only the resonance of the piece is left as a soundscape. He takes the out-of-tune zither and starts playing slow arpeggios, takes it in his hands and starts walking out from the stage. Fading out. The sound decays, the piece stops. But keeps resonating within us. Figure 20: closing part of Terpsichord (movt. 4). Sound example 10: closing part of Terpsichord (movt. 4). Olofsson, K. (2003) Terpsichord. Manuscript. CD: axelsson plays xenakis, wolff, olofsson, rzewski, cresta. Jonny Axelsson Percussion Recording (2012). Available on Spotify and iTunes. Olofsson, K. (2006) Collagéne. Swedish Music Information Center. CD: Cordes. Phono Suecia (2008). Available on Spotify and iTunes. Olofsson, K. (1999) Stabat Mater. Swedish Music Information Center. CD: Membra Jesu Nostri. DB Productions (2002). Available on Spotify and iTunes. Olofsson, K. (2003/07) Le miroir caché. Manuscript. Private recording. Performed by Ensemble Ma, soprano Ibba Andersson, conductor Staffan Larson. Olofsson, K. (2014) Arrival Cities: Hanoi. Manuscript. Private recording. Performed by The Six Tones. A Glissentar is fretless guitar manufactured by Godin with 11 nylon strings. Ten of the strings are in pairs, like a 12-stringed guitar. Normally these are tuned in unison or octaves, but inCollagéne (movement 2 of Corde) I used the peculiar tuning presented in the example. Lehmann, Hans-Thies. (2006) Postdramatic Theatre. translated and with an introduction by Karen Jürs-Munby, Routledge, London and New York. And, it should be pointed out for the sake of clarity, talking is also an action. Talking is not a text. An instrument with certain features in common with the bass cimbalom in Terpsichord. Brady, Emily. and Haapala, Arto. (2003). Melancholy as an Aesthetic Emotion. Contemporary Aesthetics. Volume 1, 2003. Section 5. Kent Olofsson is a professor of composition at Malmö Academy of Music. His composes interdisciplinary works, concert works and solo works with electronics. His paper, like that of Pia Palme discusses the concept of resonance. However, Olofsson presents are rather different though no less multifaceted approach. Through a discussion of Terpsichord for bass cimbalom and electronics as well as his theatre projects Arrival Cities and Hamlet II: Exit Ghost he discusses resonance both as a compositional and narratalogical device that underpins his work.